Discussion in 'The Americas' started by omya, Nov 9, 2017. 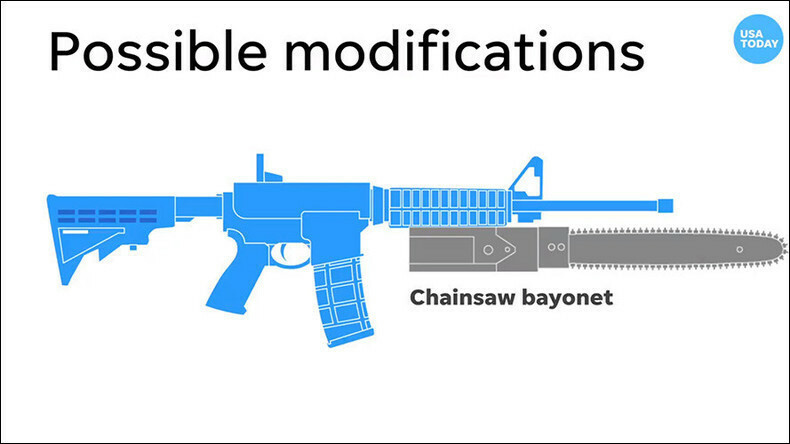 USA Today got the opposite reaction it was looking for when it posted a video claiming the AR-15 rifle, used in the recent Texas church shooting, had the ability to be modified with a chainsaw bayonet. Tweeters immediately reacted with ridicule and skepticism to the publication’s claims. USA Today posted the video Wednesday morning, showing a Ruger AR-556 rifle, with several modifications, including a chainsaw, moving on and off the gun, all to the sound of ominous music. The AR-556, which Devin Kelley used to murder 26 people in Sutherland Springs, Texas on Sunday, is a variation of the AR-15 rifle. The same user followed up with another tweet, only this time, the modification he tacked on to the gun was a bit more farfetched. Wolfpack, Lion of Rajputana and Angel Eyes like this. Sonu Nigam azaan tweet gets Sonu Sood trolled.